St. Augustine Parish is deeply committed to social ministry and living out the Gospel in tangible ways to helping those who are marginalized in our society. We participate in programs to help those who are hungry and the homeless both in our own community and by helping other parishes and communities on the island. 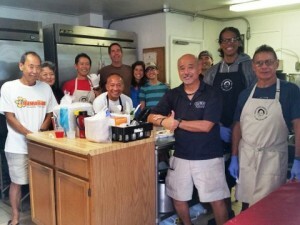 We collaborate with Holy Trinity Parish and also assist the mission of Our Lady of Kea’au. We operate a year-round program that provides a hot meal every weekday to anyone in need and we collect food and toiletries twice a year for our sisters and brothers in need on the Leeward Coast. St. Augustine parish helps to support neighboring parish Holy Trinity in the Family Promise program four times a year. Family Promise of Hawaii is a faith-group based program that offers temporary housing to homeless families. St. Augustine parishioners help to provide dinners for the families and also assist in cleaning and providing household supplies. If you would like to join this ministry, by helping with a meal, assisting with cleaning or giving a monetary donation, please contact the parish office at 923-7024 for more information and to sign up. 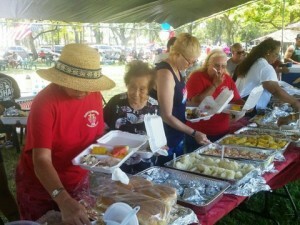 St. Augustine Church helps to support the work of Our Lady of Kea’au with those who are homeless on the Waianae Coast. We provide assistance through our twice yearly food drives (in November and during Lent) and our toiletries collections. Please check our bulletin for information on upcoming drives. St. Augustine’s Soup Kitchen offers a free, hot, nutritious meal to those who are homeless and all those who cannot afford a meal. The kitchen, in the parish’s annex building, is open from 11 a.m. to noon Mondays through Fridays, excluding holidays. The kitchen is supported by donations from parishioners and others who help us live out the Gospel call to help our sisters and brothers in need. If you would like to make a monetary donation, please call the parish office a 923-7024, or click here to Donate.